Everyone who has owned, or currently owns a dish washer, knows exactly why it is such an important tool in the kitchen. Owning a dishwasher cuts down an individual’s clean up time significantly. However, more importantly, it prevents germ and bacterial growth that hand washing cannot and is more economically friendly. If you do not currently own a dishwashing appliance you may want to consider one, but if you do – here are some common dishwashing mistakes to keep in mind for your next use! Top Rack vs. Bottom Rack – Believe it or not – where you place your kitchen items actually does matter. Depending on the item, some can melt, crack, or warp as a result of which rack you place them on. What items should go on the top? Glasses, cups, larger serving or cooking utensils and bowls should be placed on the top rack. Likewise, plates, pots, and eating utensils should be placed on the bottom rack. 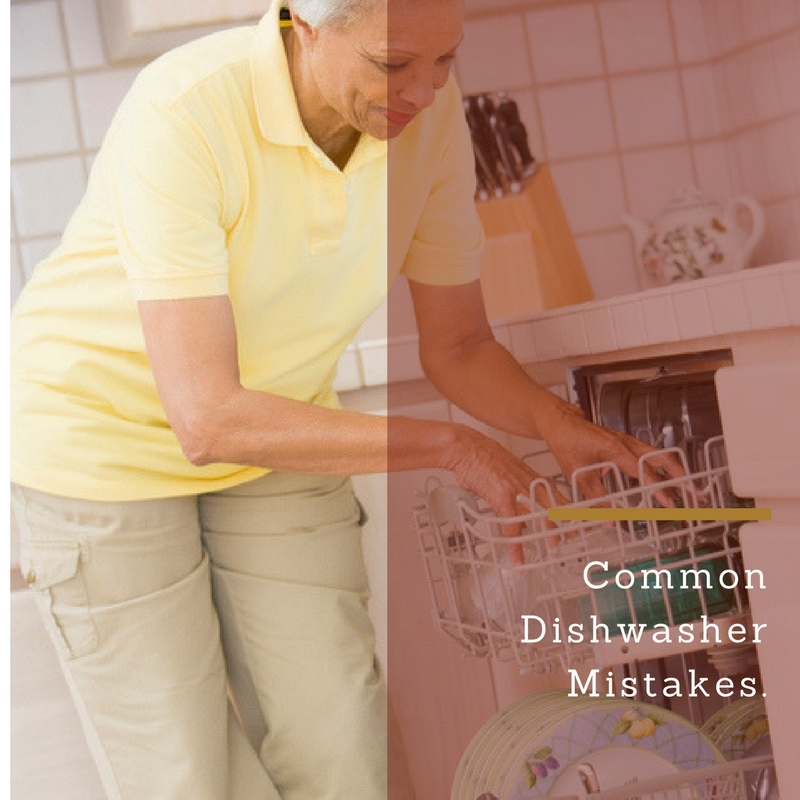 It is also a good idea to carefully read up on some of your dishwasher-safe items, as many items are only “dishwasher-safe” on the top rack. Dishwasher Detergent – Did you know that using the right dishwasher detergent, and following dishwasher detergent instructions, is actually critical to the entire process. Some believe that the more detergent they use, the cleaner their dishes will be. However, this is not necessary true. Many times this can leave a greasy residue on your plates and cook ware. Be sure to use the best detergent and read the directions carefully! Blocking the Sprayer – Are you aware of where your dishwasher sprayer is? If not, it is a good idea to become familiar with its location. The dishwasher sprayer should be able to reach every dish in the cycle; this becomes difficult when the sprayer is blocked by a larger pot or pan. Sometimes your cycle will not end as clean as you would like, so be sure to leave room for your sprayer! Nesting Utensils – Nesting utensils are the clusters of knives, forks, or spoons in the dishwasher that are notorious for sticking together and holding onto food or residue in the dishwasher. It is a great idea to alternate utensils in every which way to prevent these clusters. It will allow for a cleaner, residue-free cycle! Unloading – Ah, the final step in the dishwasher process. A quick tip for unloading the dishwasher is to unload the bottom rack first. Many times the top rack items will pool excess water. If you unload the top rack first, this water will drip and spill on the cleaned and dried bottom dishes below.